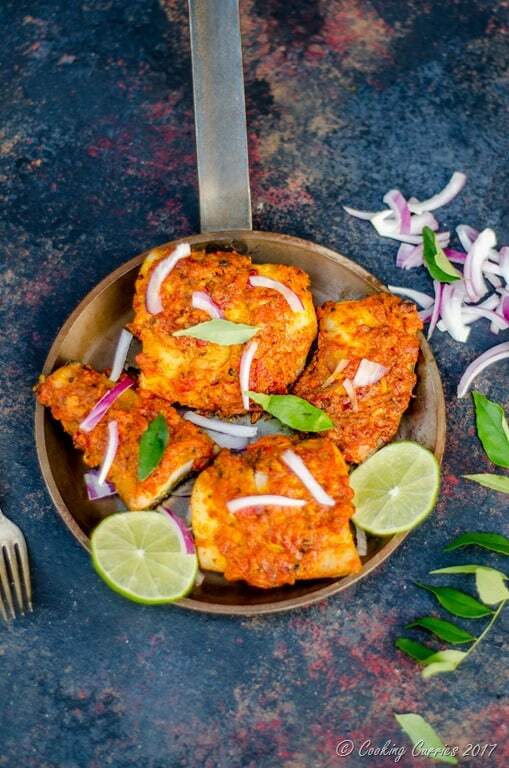 Spicy fish “fry” that is baked instead, with some delicious Kerala style spice marinade. This is a great side to rice and curry or even an appetizer! Being a vegetarian, you would think I will have a tough time cooking with meat and seafood. But its not. The reason I am a vegetarian is because I have been brought up one and Ive been one for way too long for me to develop a taste for meat and seafood and actually like it. I just treat them all as just ingredients and I don’t find them gross or unapproachable. Being married to a meat-a-holic helps too, as I use him as a testing board for everything meat and seafood I make. 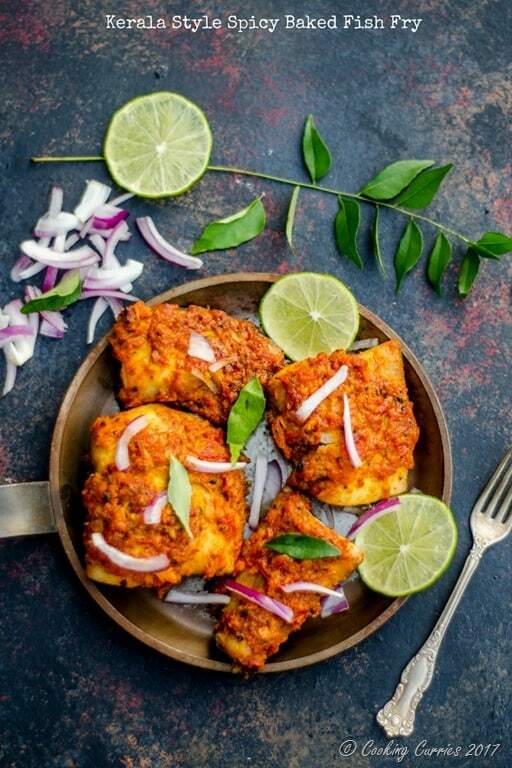 Chicken and meat has been easier to make, as I know they can stand spices, especially in the Indian style preparations and once I got used to cooking with them and knew the ingredient, I ventured out to cooking with them in other cuisines and eventually, developing my own recipes with them. But seafood was something I was always a little intimidated by. Fish and shell fish seemed too delicate, that I was afraid I would over power them with spices or worse, overcook them. 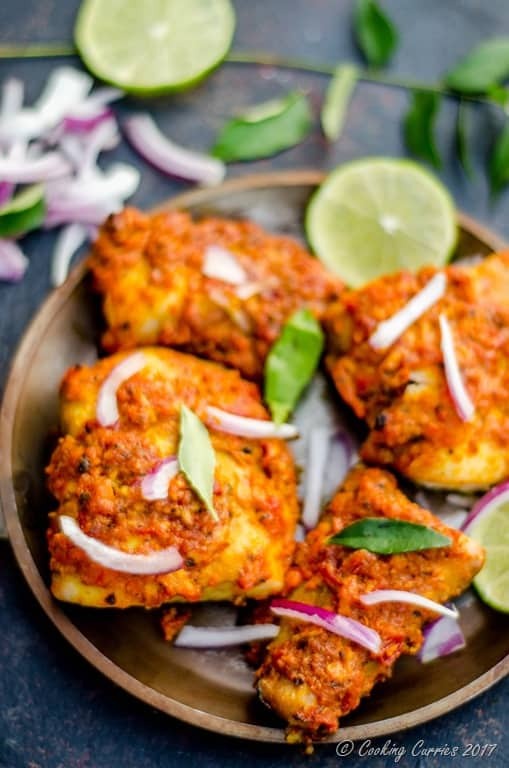 But I couldn’t deny my mallu-boy ( the husband is from Kerala, where seafood is consumed widely and mallu is slang for the language Malayalam and also someone from Kerala) some good spicy seafood. 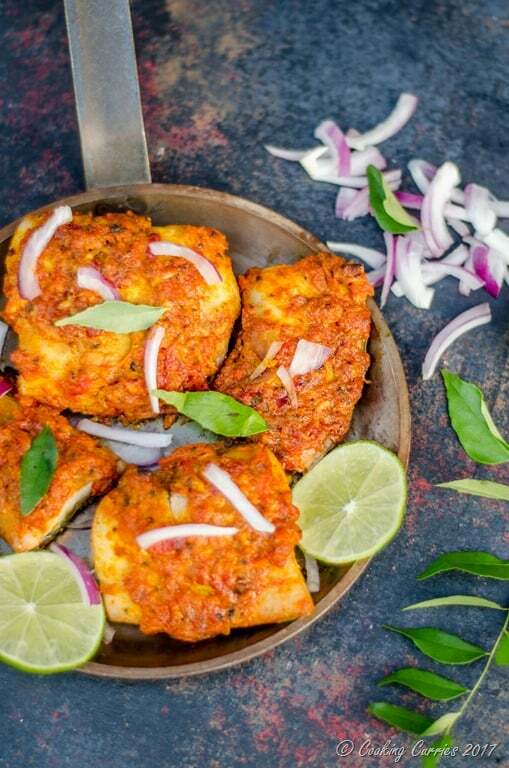 This baked fish “fry” is a similar recipe, where you really cant go wrong much. A good spice marinade for the fish fillets and pop it in the oven till the marinade is all cooked through. The fish comes out nice and flavored. Go ahead, try it, I know you will love it as much as my meat-a-holic did. Put all the ingredients under "crush to form a paste" in a mortar and pestle and grind to form as fine a paste as possible. Cut the fish fillets into two and make small slits in them. Smear the paste equally over all the fillets and marinate in the refrigerator for 20-30 mins. Line the fish on a baking tray with parchment paper on it and bake for 20 mins. To finish it off, broil on high for 3-4 mins. 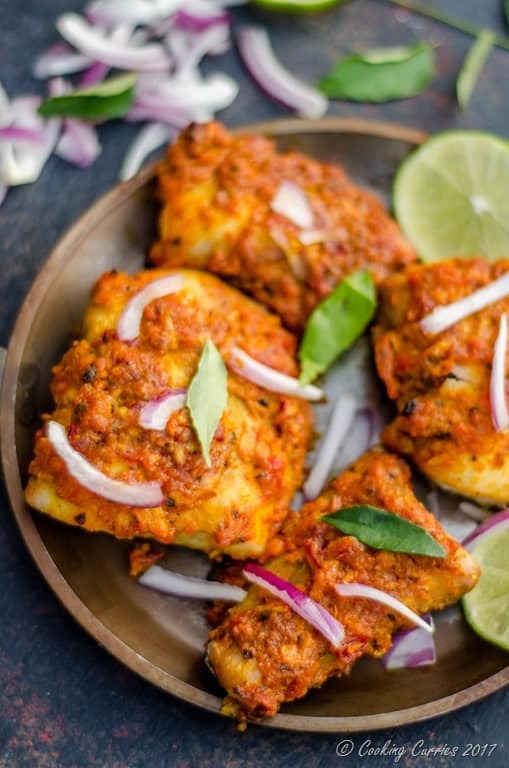 Serve with raw red onion slices and lime wedges. To check for doneness: teh spice / masala paste on the fish should have changed color slightly and not look too raw.